Ted Ligety defied his record of having never won a major race by taking the Olympic combined title at Turin ahead of a host of favourites, thereby becoming the first American man to win an Alpine skiing gold in 12 years. While the name of Bode Miller is likely more recognisable to skiing fans, the Salt Lake native outdid his flamboyant compatriot. Miller had led the entire field after the downhill, and was a massive 3 seconds faster than 32nd placed Ligety. But Miller was disqualified for straddling a gate as competitors dropped like flies on the difficult Sestrieres course. 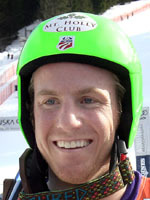 Austrian Benjamin Raich eventually handed victory to the delighted Ligety when he missed a gate during his slalom run too. The then 21-year-old, who came into the Games as a promising slalom skier but without a World Cup win to his name, edged Croatian Ivica Kostelic into second while Austria's Rainer Schoenfelder picked up bronze. For what it's worth he thereby became only the fourth American man to win an Alpine title at the Games and the first ever to cllaim the combined. Ligety's relaxed but full on style suggested he had observed Miller a great deal, but his childhood heroes had been Norwegians Lasse Kjus and Kjetil Andre Aaodt. Ligety's strong mentality and slick tecnique also means he crashes out less frequently than others. The event was a watershed in his career and he quickly followed up on his Turin triumph with his maiden win on the circuit just weeks later, taking top spot on the podium in the giant slalom at Yongpyong, South Korea. A multiple national US champion, Ligety grew up near the venue of the skiing competition that was held at the 2002 Salt Lake Games, and even played a role in them, acting as a forerunner, the guys who ski down the course ahead of the actual competitors in order to open the way. He first strapped on a pair of skis at age two and was competing by 11. Rapid progress through the junior ranks, including a 2004 world junior silver medal in the slalom, earned him a place on the US World Cup team for the start of the 2005 season. While Turin was an early career peak subsequent sporadic world cup wins including a crystal globe as 2008 winner of the giant slalom and bronze in the giant slalom at the 2009 Val d'Isere-hosted world championships confirm his status as a contender. Ligety therefore goes out to Vancouver as something of a flagbearer for the US men's team.